Louis Bloom (Jake Gyllenhaal) is unemployed and desperate for money and a job. He currently makes money by stealing fences and other metals to sell for scrap. He is a very driven and articulate man with an almost photographic memory, but he has been unable to find work. One night, he comes across a severe car crash and stops to take a look. Just then, a freelance videographer (Bill Paxton) jumps out of a van to shoot footage of the wreck to sell to a local news station. Louis decides that this is the perfect line of work for him, so he steals a bike and trades it for a camera and a police scanner. Since he is a driven man, he learns quickly and starts to find out what kind of footage news studios want. Louis also seems to lack any moral compass and starts to manipulate crime scenes for better shots and even withholds evidence from police to help create more photogenic footage. This lack of morals and willingness to do anything for the right shot helps his footage become very in-demand and among the most valuable out there. This is not a movie for the faint of heart, and not for the obvious reasons. The character of Louis Bloom is a complete sociopath not unlike your Patrick Bateman's, or even more recently, your Amy Dunne's. He has no problem hurting people, stealing, manipulating, exploiting, and blackmailing. We as an audience are often horrified by Louis' actions, and yet early on in the film, we are somewhat convinced and want him to succeed. He gives speeches to those around him to motivate them and empower them, and though eerily compelling, the words he panders are shallow and hollow. In reality, Louis is just a part of a larger machine. He seeks to create the most violent, horrific footage possible because that is what the news networks want to show on television. News networks want and need to show this horrific footage because that is what the viewers want to watch. As pointed out in this film, violent crime rates have been on a steady decline for years, but coverage of crime has regularly increased. The media makes it a point to keep a culture of fear in the televisions of Americans, which makes already scared citizens tune into the news to drive up ratings and make the networks money, all while simultaneously smudging facts, altering details, and widening the divide between cultures and neighborhoods. Louis might be a lunatic, but he is not the only villain in this film. Jake Gyllenhaal completely transformed himself for the role of Louis Bloom. From a gaunt and thin exterior (he lost around 25 pounds for this part), to huge bags and dark circles around his eyes, slicked-back hair and an almost homely and conservative dressing style, he was outstanding in this movie. The manner in which he manages to convince audiences with this role is unsettling, and we wonder if there is any Bloom within himself that he was channeling. Though 98% of what he does is morally and ethically reprehensible, the advice Bloom gives throughout the film is that of a motivational speaker, exclaiming the virtues of proper work ethic and going after what you want while moving bodies in active crime scenes into the perfect light to film for money. The line between thrilling and sickening is exhilarating, and Gyllenhaal drives these points home as the fast-talking, conniving yet sort of charming Bloom. There is no doubt in our minds that Gyllenhaal has delivered an Oscar-worthy performance. Renee Russo plays another stand-out role in the film as nighttime news director Nina, who never stays at one station long enough to make an impact, though we can see why if she operated at other stations with the same blatant dishonesty. Perhaps the most disturbing part of "Nightcrawler" is not only the perpetuation of stereotypes by the media, mostly behind the scenes, but the manner in which Nina almost gets off on what Louis shoots for her. Who is worse: the person who takes video images of grisly crime scenes and dead bodies where crimes have been perpetrated, or the person who literally smiles with joy watching said footage and ends up paying for it, then broadcasting the footage while being sure to emphasize just how far in a hand-basket we as a culture have gone to hell. There have been many times in my life where I have glued myself to a television screen in order to absorb every possible detail about a breaking news story, whether it was in my area or nationally. This all seemed to start around the time of 9/11, and most recently, was done with the bombing of a Malaysian Airlines plane over the Ukraine. It's actually pretty sickening, looking back on the times I have done this, because the first story that gets reported is never actually what happened in reality. Who knows if what we are being told is the truth or not? 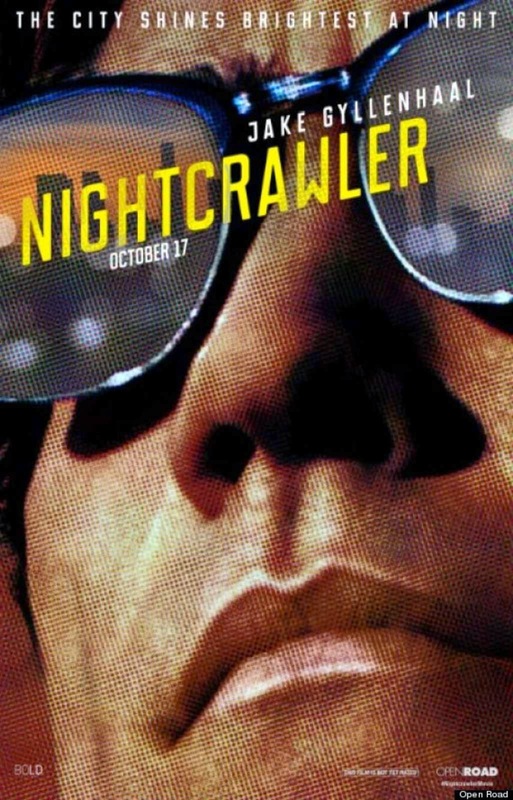 Everything in "Nightcrawler" makes you question what you think you know about the modern day media. The movie as a whole is phenomenal, from the impeccable pacing to the overall thrilling ride, and from to the triumphant score over a macabre subject matter to the entertainingly original yet morose script and screenplay. This has all the ear-markings of winning film.